If you want to travel cheaply to Mombasa, bed and breakfast style hostels are one option. Bed and breakfasts are usually cheaper than resorts or hotels, but not always. A typical bed and breakfast stay will offer a breakfast, though what constitutes a breakfast meal can vary quite a bit from place to place. As in most of Kenya, Mombasa bed and breakfast inns are often called guest houses or hostels and you shouldn't assume they have the same level of facilities as bed and breakfasts in North America. Many still offer shared bathrooms and only the more expensive ones are likely to have air-conditioning – which isn’t a luxury in hot and humid Mombasa. 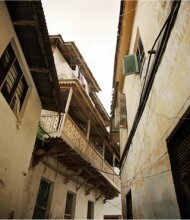 Because the term "bed and breakfast" isn't used in Mombasa as consistently as in North America or Europe, it can be difficult to find these specific types of inns. Below are a few good choices, at different budget levels. You can read reviews about these places or book them at Hostelworld.com – a great service started by some enthusiastic young back packers and they have some 30 good quality hostels in Kenya, including the hostels mentioned below. The Beach - Bar Restaurant & Camp Lodge – A hostel located directly at the beach in a fishermen’s village. For a hostel, it has remarkably well facilities, including a bar and restaurant, internet access, rental bikes, a small grocery shop, left luggage, cash exchange and lockers. It’s also possible to bbq or grill your own food. Rates p.p. start around US$ 13. Msafiri Cottages – A family-run guest house with 6 cottages of 4 rooms each. It’s also possible to camp here or sleep in a dorm. Facilities include ceiling fans (but no air conditioning), secure car parking, laundry service, left luggage and a small bar/restaurant. Rooms have a private shower but no hot water (but that goes for most budget and even some midrange places). In their office, they only accept cash payments. Room rates p.p. start around US$ 18, camping at US$ 9. Kiembeni Guest House – A bed and breakfast very centrally located at Moi Avenue in Mombasa centre, above a restaurant right next to the famous tusks that cross Moi Avenue. It’s a small house with 3 bedrooms. Facilities include a ceiling fan (but no airconditioning), kitchen, laundry service, and TV with DVD player. Rates p.p. start around US$ 25. Kenya Bay Beach Hotel – Located directly at Bamburi Beach. Next to bed and breakfast basis, it’s also possible to stay here on half board and full board basis. For a place with a B&B option, it’s large (over 200 beds) and it has the facilities of a full beach resort, including swimming pool, restaurants, bars, entertainment, etc. All rooms have air conditioning, balconies and private bathtubs/showers. The bed and breakfast rates p.p. start around US$ 45. Although accommodation is generally cheaper in Mombasa than Nairobi, accommodation is not be as cheap as you might have hoped, knowing this is Africa. The high end places are just as expensive as North America or Europe, and only on the bottom end of the market will places get really dirt cheap (but the quality is correspondingly low).